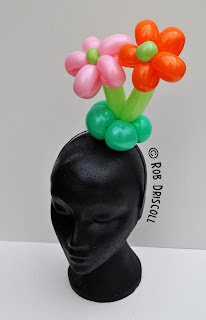 I have been playing with hairbands a bit recently after purchasing a load from Roger at a recent balloon event, this one is made from 4 balloons (and a hairband). The balloons are all 160s. You can keep up to date with all the latest news and sculptures by heading over to Facebook -www.facebook.com/mydailyballoon and hitting the 'like' button.